Hundreds of firefighters are battling a wildfire in Portugal’s southern Algarve region during the height of holiday season. More than 100 people were evacuated from villages near Monchique, in Faro district, on Saturday as two blazes raged close by. Portugal’s National Civil Protection Agency said 700 firefighters and water-dropping aircraft had been deployed in a bid to contain the flames. Nine emergency workers have been injured since the fire broke out on Friday, although none are thought to be seriously hurt. 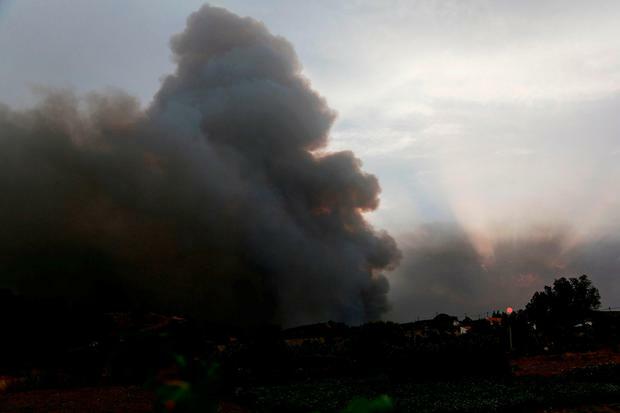 Vaz Pino, commander of relief operations in Faro, told Jornal de Notícias residents in rural areas were being moved “long before the fire hits”. “The fire continues with two active fronts, one of them totally under control and close to extinction and another which continues to burn in an area inaccessible from the ground,” he said. He added water drops from aircraft had so far proved ineffective against the fire continuing to burn out of control, due to its location in a valley. The government says only about 15 percent of the 10-year average area has been charred so far this year. However, the Iberian Peninsula has been hit by a heatwave this week, with some inland areas sweating in 45C conditions. Temperatures in Portugal peaked at 46.4C on Saturday, a degree off the national record set in 2003. In the Alentejo province, which saw the worst of the heat, streets were largely deserted. Some farmers chose to work during the night instead of in the heat of the day. In neighbouring Spain, authorities said three people had died this week due to high temperatures, including a 41-year-old road worker collapsed on a highway near Murcia. The Portuguese president, Marcelo Rebelo de Sousa, said on Friday authorities were prepared for wildfires despite the heatwave conditions and could deploy around 11,000 firefighters if needed. “Fortunately in this abnormal situation we have not had many other incidents like the one in Monchique,” he told Publico.